As a specialised UK supplier of microwave oven parts, we provide you with an extensive range of microwave oven spares for both domestic & commercial microwaves. You can either browse by brand or category to find the microwave oven spare you need. If you know your model number, please type it in the blue search box at the top of any page. This will generate a list of all the parts that we offer for that model. We can also help you to find your model number. 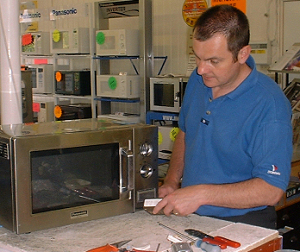 As a specialised manufacturer in Cooking Equipment Parts, also discover our range of Oven Elements & Breadmaker Spares.